In this post we are going to construct a joule thief circuit without a ferrite core or coil winding. We will be utilizing an ordinary center tapped step-down transformer as replacement for coil construction. In this way we can make a joule thief circuit even easier. What is joule thief circuit? Joule thief circuit is an oscillatory voltage booster which can boost small amount of voltage around 1V or less to a usable voltage to drive small loads like LEDs. 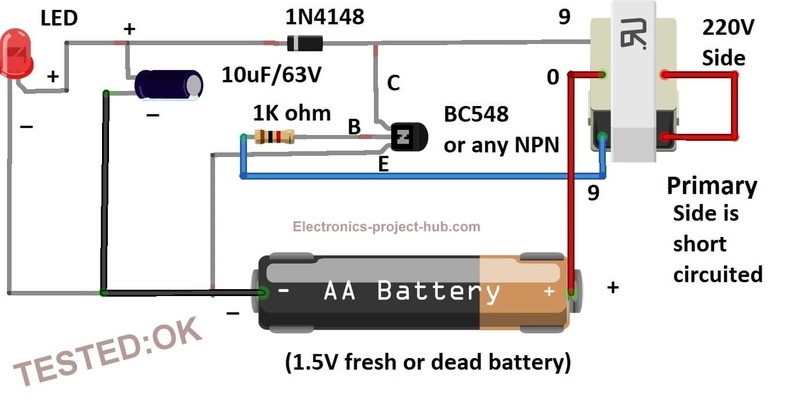 The joule thief circuit extracts almost all energy from a standard single cell. The circuit got its name as joule thief because circuit depict like it is stealing energy from the source. The joule thief circuit is a type of “blocking circuit”. Blocking circuit is a simple circuit consisting of a transformer, a resistor and one amplifying device like a transistor that produces free running oscillation. The name “block” was given because the amplifying device or the transistor or vacuum tube blocks or cut-off most part of the duty-cycle of the periodic pulses. The output of the blocking circuit is non-sine wave and was used for tone generation which served for application such as alarm or mores-code practicing device. The modified circuit of blocking circuit is joule thief circuit. A typical joule thief circuit consists of a ferrite core with two windings and 4 terminations. A resistor usually of 1k ohm is used as base current limiting resistor, any low power NPN transistor can be used and even a PNP transistor can also be used but, the polarity of the supply and polarity of LED need to be reversed. We are going to replace the coil winding on ferrite core with a ready-made normal centre tapped transformer which works similar to a ferrite core one. Now let’s understand how the joule thief circuit able to drive a 3V LED from an almost dead battery. When we turn on the circuit, the current flows through the resistor and to left hand side of the coil winding and reach the base of the transistor. 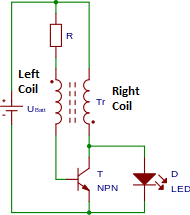 This will turn ON the transistor partially and passes current through the collector-emitter junction. A small current now will flow through the right hand side of the coil winding (refer diagram) due to current passing through collector-emitter junction. The right hand side coil produces magnetic field and induces a greater voltage on the left hand side of the coil (mutual induction). Now the left hand side of the winding passes more voltage to the base of the transistor, which makes the collect-emitter junction to conduct more voltage through the right hand side of the coil. Now the right side winding will induce more voltage on the left side winding which passes even more current through base. This cycle continues till the transistor is full ON / transistor is saturated. Now the right side coil is no more increasing its magnetic field and the transistor is fully ON and no more magnetic field is induced on the left hand side of the coil which is responsible for biasing the transistor. Due to this very less voltage is passing through the base now and the collector-emitter junction is narrow and the transistor is almost in off state. The magnetic field on the right side coil winding will collapse on itself and induce a spike of voltage. The induced voltage cannot flow through the transistor since it is in off state. The induced voltage will flow through the load or LED, the LED lights up until the voltage fully dissipated through LED. Once the voltage is dissipated via load, the process starts from the beginning. The on-off of the transistor will occur around 50,000 times a second. The above circuit is joule thief circuit using an ordinary step-down transformer with centre tap. 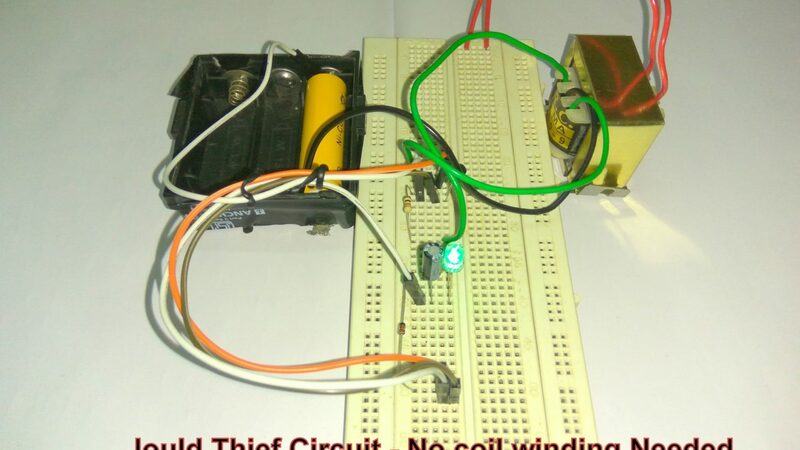 The coil winding with ferrite core is the tedious part of the joule thief circuit construction and most beginners are very reluctant to build the coil, some of them can’t find the ferrite core for their project. Utilizing a transformer will eliminate these problems and the above circuit will function as good as with ferrite core one. Some improvements are done to increase the power output of the circuit. A diode 1N4148 and a electrolytic capacitor is added to the circuit which increase brightness of the LED and the output voltage remains constant regardless of the circuit oscillating at 50 KHz. The diode 1N4148 is used here not for rectification but to block the reverse voltage from capacitor and make sure all the energy is flowing through LED. 1N4148 is used because it is a germanium diode which has least voltage forward drop than conventional silicon diode like 1N4007. 1N4007 diode will also work but to get most out of your circuit, a germanium diode like 1N4148 is recommended. The primary side of the transformer is short circuited; this will increase the brightness of the LED. 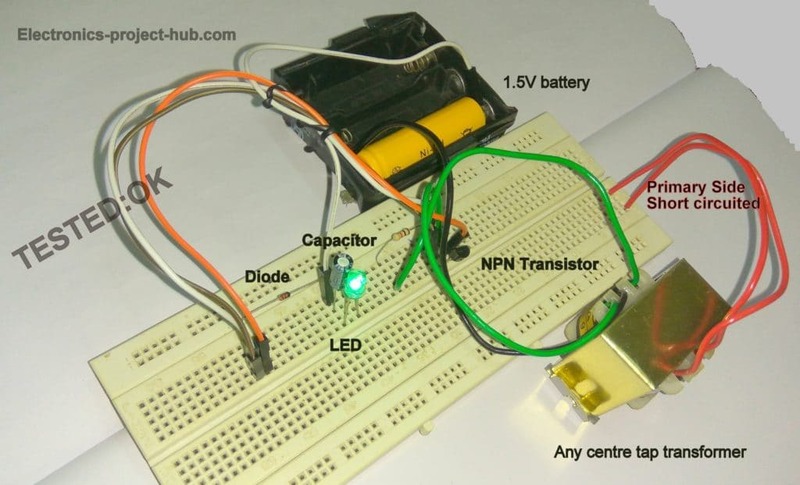 You should always connect the LED before you power the circuit, if no load/LED is connected the voltage across the capacitor will rise around 50V with-in seconds and connecting the LED after powering the circuit will kill the LED instantly due to very high voltage across the capacitor. If you have any questions, please comment below, you can anticipate a guaranteed from us.